Vale of Ffestiniog - Snowdonia Cottages - Snowdonia - North Wales. Visit us for the Perfect Break! 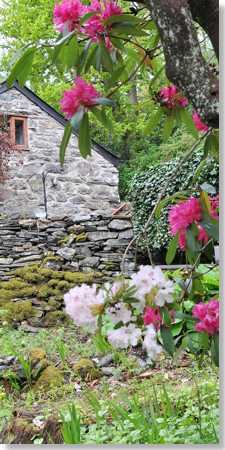 ‘The Coach House’ is a quaint, romantic Grade II listed holiday cottage, nestled in the private grounds of the beautiful former 'Rectory of Ffestiniog'. Beautifully converted it is set in a stunning location with glorious views of the Vale of Ffestiniog in the heart of Snowdonia National Park. Within 10 minutes walk of two pubs this beautiful holiday cottage offers a truly relaxing Welsh cottage holiday for those who either wish to leave the car untouched or who wish to pursue a number of outdoor activities. 'ZIP WORLD' the largest zip wire in Europe/The World and 'BOUNCE BELOW' huge trampolines hung in historic Slate mines are only minutes away! It is conveniently situated close to the village of Maentwrog and the harbour town of Porthmadog with its numerous shops, restaurants and bars. Only a short distance from an array of gorgeous secluded sandy beaches, historic castles, the Ffestiniog Narrow Gauge Railway and Italianate Portmeiron....there is something for everyone! 'The Coach House' is also the perfect holiday retreat for those who just want to relax and get away from it all! Walk through the beautiful Vale of Ffestiniog stopping to admire the pretty bluebell woods. 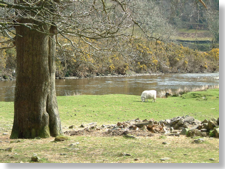 Stroll to the pub by the river Dwyryd or just curl up with a book on your private sun terrace and watch the world go by! The perfect romantic country cottage holiday! Porthmadog - 7 miles, Portmeirion - 5 miles, Ffestiniog Narrow Gauge Railway - 7 miles, Pub - 0.5 miles, Indian Restaurant - 4 miles, Shop 4 miles. Copyright © 2014 Vale of Ffestiniog Holiday Cottages. If you are looking for Snowdonia Cottages then look no further than Vale of Ffestiniog Holiday Cottages. Looking at weekend breaks, a mid week break or a full week, then we will have the perfect rural retreat to suit you. Our cottages in Wales are affiliated with Hoseasons who provide holiday rentals across the UK. If you wish to pay by credit card you may do this with them directly. 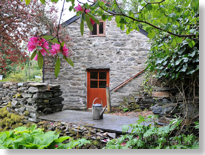 They have a number of holiday cottages, cottages snowdonia, country cottages, Snowdonia cottages and weekend breaks. Our holiday cottage in Maentwrog, Snowdonia is totally equipped for the perfect wales holidays and has the most spectacular views and walks. Visit Portmerion and the Ffestiniog Railway when you are here. If you are searching for any of the following - Snowdonia cottages, cottage snowdonia, holiday cottages Wales, holiday wales then we have the perfect cottage for you. The Coach House is a stunning Grade II listed country holiday cottage which sleeps three people. Available for short breaks, midweek breaks and weekend breaks between Oct and Mar. Slap bang in the middle of Snowdonia this is the heart of the national park. Rugged mountains on 3 sides and sandy beaches along the shore. Dwyryd and was rowed out on the tide past Portmeirion to waiting ships.